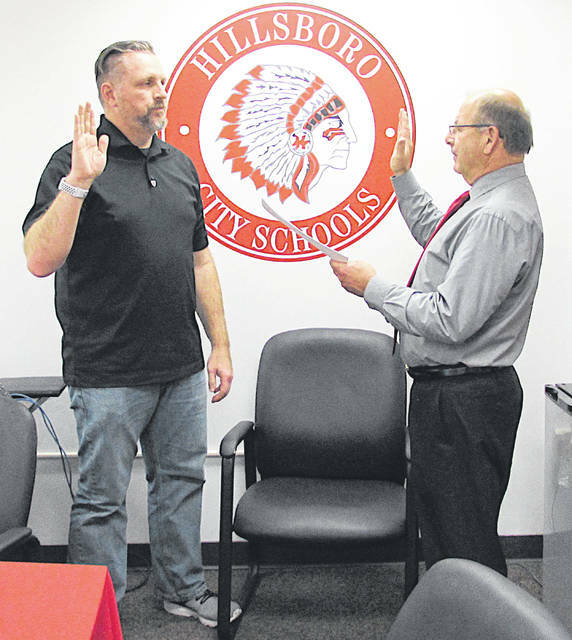 Bill Myers, left, is sworn in as the 2019 president of the Hillsboro City Schools Board of Education by Treasurer Ben Teeters during a board reorganizational meeting Monday evening. 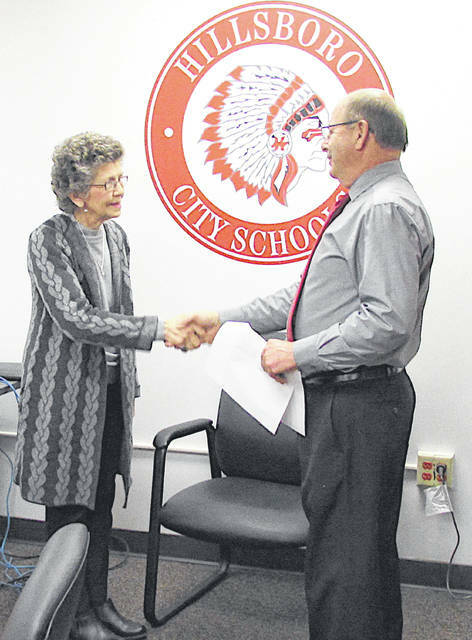 Beverly Rhoads, left, is sworn in as the 2019 vice president of the Hillsboro City Schools Board of Education by Treasurer Ben Teeters during a board reorganizational meeting Monday evening. Bill Myers and Beverly Rhoads were unanimously re-elected as president and vice president, respectively, of the Hillsboro City Schools Board of Education during a brief reorganizational meeting held Monday evening. Both board members held the same position a year ago. Myers, entering his 10th year on the board, was elected as president for his fifth one-year term. Rhoads is starting her 14th year on the board. The board also voted to continue holding its regular meetings at 7 p.m. the third Monday of each month at the board office at 39 Willetsville Pike, on the site of the former high school/middle school. The next regular board meeting will be held at 7 p.m. Monday, Jan. 21 at the board office. The board certified the school district’s enrollment at 2,344 students as of Dec. 31, 2018. Of that number, 27 juniors and 39 seniors attend Laurel Oaks. It marked the third straight year the enrollment figure has dropped in Hillsboro. Last year the total enrollment on the same date was 2,362 students, the year before that it was 2,419 students, and at the end of 2015 the number was 2,550 students. At the end of 2014, the board certified that it had 2,538 students. Superintendent Tim Davis said a year ago that he did not have an explanation for the drop in enrollment, but did note that the number of students in each grade appeared to be declining from the fourth grade on down, and he provided figures to verify that statement. He could not immediately be reached for comment Tuesday evening. Among other routine beginning of the year resolutions passed during the meeting, the board approved its estimated expenditures for the fiscal year running from July 1, 2019 to June 30, 2020 at $27.91 million, and elected board members to various committee. On the school board’s committees, Rhoads and Larry Lyons remain on the finance committee, with Myers as the alternate, and the policy committee members are Tom Milbery and Rhoads. On the superintendent’s committees: Lyons is the Ohio School Board Association legislative liaison; Rhoads is the Great Oaks representative; Lyons is the American Disability Act representative; Rhoads is the Southwest Regional Board rep; Rhoads is the Business Advisory Council rep, with Lyons as the alternate; Milbery and Myers are on the athletic council; Jerry Walker is the HEA and OAPSE rep; Walker is the wellness rep; Milbery and Lyons are on the community relations committee; and Myers is on the technology committee. No visitors showed up for a budget hearing that was scheduled for 6:30 p.m. prior to the board meeting. https://www.timesgazette.com/wp-content/uploads/sites/33/2019/01/web1_Myers-swearing-pic-1.jpgBill Myers, left, is sworn in as the 2019 president of the Hillsboro City Schools Board of Education by Treasurer Ben Teeters during a board reorganizational meeting Monday evening.